Dr. William Sears is considered by some to be this parenting generation's "Dr. Spock." He is well-known for his suggested parenting methods which have grown into the attachment parenting movement. Part of Dr. Sears's theories focuses on his beliefs regarding baby sleep, including co-sleeping. On the spectrum of infant sleep theories, Sears is pretty much opposite the ideas of Dr. Ferber's "cry it out" methods. He advocates "gentle methods" of encouraging babies to sleep through the night, rather than methods that might increase a baby's stress and anxiety level. Not so many years ago, an incredulous look complete with jaw drop would greet the mother who had just admitted to co-sleeping with her baby. Though co-sleeping is somewhat common in other cultures, it has taken off here in the United States in recent years. As more parents accept the practice and more literature is published on the topic, perhaps it is becoming less strange to our American society. If you are unfamiliar with it, you might think that co-sleeping means sleeping with your baby in your own bed. While this is common, Sears has changed his description of co-sleeping to include other ways you can sleep with your baby. Sleep that occurs within arm's reach of your baby is also co-sleeping. Sears widened his description of co-sleeping to include having the baby sleeping in her own crib located right beside the parents' bed or in a co-sleeper bassinet that abuts the parents' bed. 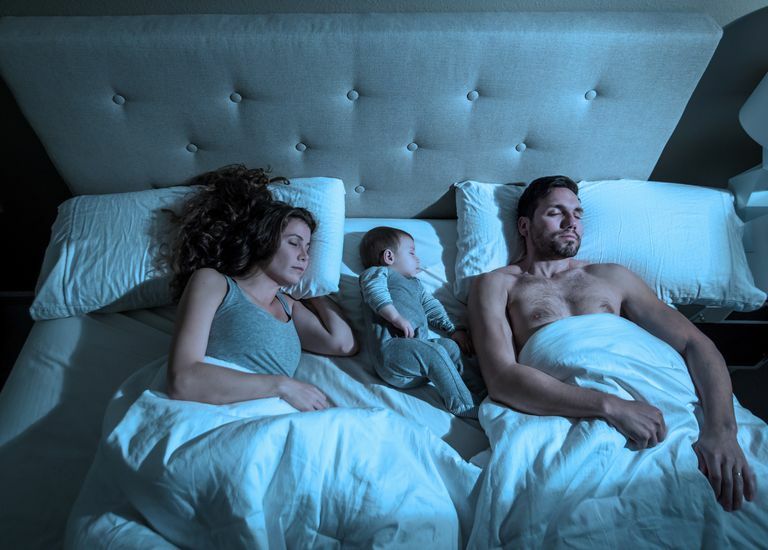 When Sears clarified his position on co-sleeping to include sleeping close to your baby, he also posed that a better way to refer to co-sleeping is "shared sleep." Presumably, his attempts to spell out that shared sleep can take on other forms came on the heels of increasing concerns about co-sleeping safety voiced by the AAP. Regardless, Sears still maintains that when the appropriate safety precautions are taken, however parents and baby share sleep, it has benefits to all of them. More mothers report a better night's sleep. It promotes breastfeeding by allowing a mother to respond to her baby's feeding needs without having the child (or even herself) wake up fully. Co-sleeping advocates point to research that suggests that when parents take sleep safety precautions it reduces the risk of Sudden Infant Death Syndrome. One of the biggest disputes regarding co-sleeping focuses on safety. While the AAP nods in agreement that sharing a room with your infant is a wise move, it provides strong opposition to sharing a bed. Attachment Parenting International and the AAP have certainly gone several rounds over the argument of which method is safer, each showcasing studies that support their viewpoint and pointing out holes in the research of the opposing view. If you choose to share sleep with your baby, taking precautions can ensure a safer night's rest. Most of these suggestions are common sense ideas that attempt to reduce the risk of smothering the baby during sleep. Keep bedding away from your baby at night just as you should if you would place her in a crib. Sleep sacks are a wonderful alternative to blankets. Never sleep with your baby in a waterbed or on unstable, overly soft bedding or couch. Mothers who smoke should not share a bed with their baby. Never sleep with your baby if under the effects of alcohol or medications that alter your conscious level. Parents who have sleep disorders, are extremely sleep deprived, or who are excessively obese should opt to have their baby sleep in a bassinet or crib located beside their bed. Sleeping through the night is developmental. Sears urges parents not to expect their baby to be like another's who slept through the night at 6 weeks. The age at which babies are developmentally ready to sleep through the night varies greatly. There are health benefits to night waking. Sears maintains that coercing a baby to sleep through the night by methods such as crying it out or increasing daily caloric intake may not be healthy. As babies drift in and out of sleep, they are more able to communicate their needs, such as feeding. He professes that babies sleep as they do because they were designed to wake frequently through the night. When their natural sleep rhythms are thrown off, it may cause serious health problems. There is nothing wrong with helping a baby fall back to sleep. While some babies can settle themselves back to sleep easily, Sears recognizes that others struggle during this "vulnerable" period of light sleep. He encourages parents to use soft words, feeding, or a gentle touch to help put a baby back into deeper sleep. Blair, P.S., Fleming, P.J., Smith, I.J., Platt, M.W., Young, J., Nadin, P. & Berry, P.J., (1999). Babies sleeping with parents: case-control study of factors influencing the risk of the sudden infant death syndrome, British Medical Journal, 319(4): 1457–62. Crawford, M., (1994). Parenting practices in the Basque country: Implications of infant and childhood sleeping location for personality development. Ethos, 22(1):42–82. Hauck, F. R., et al. (1998). Bedsharing promotes breastfeeding and AAP Task Force on Infant Positioning and SIDS. Pediatrics, 102(3) Part 1: 662–4. Task Force on Sudden Infant Death Syndrome. The Changing Concept of Sudden Infant Death Syndrome: Diagnostic Coding Shifts, Controversies Regarding the Sleeping Environment, and New Variables to Consider in Reducing Risk. PEDIATRICS Vol. 116 No. 5 November 2005, pp. 1245-1255 (doi:10.1542/peds.2005-1499. Can a Good Baby Nap Pattern Improve Nighttime Sleep?